Reacting to an increasingly assertive China, Japanese Prime Minister Shinzo Abe has looked to expand his country’s influence in the Indo-Pacific. Trips to Pakistan, Sri Lanka, and the Maldives in January 2018 culminated in Abe and Sri Lankan President Maithripala Sirisena holding further talks in Tokyo during March, where the pair focused on issues of economic and maritime co-operation, security and regional order. Desperate to maintain the balance of power despite Chinese military superiority, Japan has gradually shifted in its foreign policy towards a policy of ‘minilateral engagement’ with regional players. The two leaders agreed to promote the US-Japan-led ‘Free and Open Indo-Pacific Strategy’, and signed a 10.6 billion yen ($100.4 million) loan agreement to improve Sri Lanka’s healthcare services. Japan has been one of Sri Lanka’s largest bilateral donors and thus one of its main development partners. The two countries officially established diplomatic relations in 1952, but economic ties improved after the Sri Lankan civil war ended. The volume of bilateral trade reached 102 billion yen ($971.6 million) in 2016. In view of the island’s strategic location, Sri Lanka is courted by China and other countries preoccupied with security in the Indian Ocean Region (IOR). China, Japan, and the United States have consistently looked to Sri Lanka as a valuable ally and strategic bulwark against contenders. 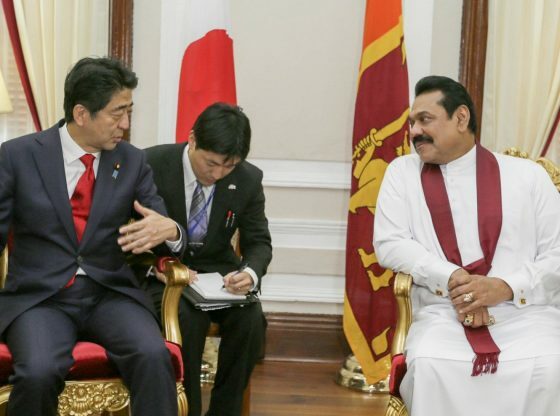 This article examines the ways Japan’s government has courted Sri Lanka as a geopolitical partner, and asks what the future has in store for Japanese-Sri Lankan diplomacy. At the centre of the arc connecting the Persian Gulf to the Strait of Malacca, Sri Lanka is destined to play a key role in the Indian Ocean. Every year, more than 60,000 ships navigate the vital sea lanes of communication about 10 nautical miles off the Sri Lankan coast, carrying two-thirds of the world’s oil and half of all container shipments. While Japan is dependent on imports for more than 90 percent of the energy it consumes, increasing threats from China could put it in dire straits. Chinese control over a strategically located port raises fears that it may become a Chinese military base, despite the government in Colombo assuring that ‘we will never permit anything like that in Sri Lanka’. After the Cold War, Japan focused on its relationship with the United States. Yet, Japan has also been opening itself to multilateralism, becoming actively involved in the work of the United Nations. However, multilateral fatigue and the necessity to resolve common regional issues has led Japan towards minilateral security cooperation, where small-scale, transnational agreements between neighbours ensures regional order. The inauguration in June 2015 of the first ever trilateral dialogue between Australia, India and Japan is a case in point. Increasingly focusing on the IOR, the Japan Maritime Self-Defense Force joined the US and Indian trilateral naval exercise, ‘Malabar’ and became a permanent member in 2015. The same year, Prime Minister Abe suggested the Sri Lanka Navy join the Malabar exercise as an observer. Symbolically significant, two Japanese ships visited Colombo port on 20th July 2017, straight after the annual Malabar naval exercise series ended. On the occasion of the Japan-Sri Lanka Summit Meeting of April 2017, Abe reaffirmed his call for co-operation and declared Japan was looking for Sri Lanka’s participation as an observer in the next Japan-India joint exercise between coast guards. Japanese expectations were met in January 2018, when Sri Lanka and the Maldives participated as observers. Japan is also aiming to strengthen maritime security through technical projects and equipment provision. For instance, Japan provided patrol boats to the Sri Lankan Coast Guard, based on the Grant Agreement signed by the Sri Lanka Government and the Japan International Cooperation Agency on 30th June 2016. Japan may also export used P-3C patrol planes to Sri Lanka. These planes are also used by Japanese allies like the US, Australia, South Korea and New Zealand, and could facilitate information sharing. In April 2017, Japan announced its decision to invest in Sri Lanka’s port infrastructure, with a grand sum of 1 billion yen ($9.46 million) being dedicated to the improvement of Trincomalee port. But it is with China in mind that regional players like Japan and India show such interest in investing in Colombo and Trincomalee ports. Back in 2010, Sri Lanka turned to India to develop Hambantota port, but India declined the costly proposal and Sri Lanka had no choice but to turn to China. China invested billions of dollars. Struggling with debts, Sri Lanka could not afford to pay back the loan and ultimately handed over Hambantota port to China for 99 years. Chinese control over a strategically located port raises fears that it may become a Chinese military base, despite the government in Colombo assuring that ‘we will never permit anything like that in Sri Lanka’. Sri Lanka was an early advocate of the Chinese Belt and Road Initiative. However, seeking further foreign investments, it is also deepening its relations with other countries such as Japan, India, and the United States. Importantly, Sri Lanka and the United States held their first Partnership Dialogue in February 2016 on the basis of shared ‘commitment to democracy, rule of law, and shared prosperity’. These values are also those underpinning the Quadrilateral alliance (Quad) formed by the US, Japan, India and Australia in order to contain China. Torn between China and its Indian “Big Brother”, Sri Lanka plays a delicate balancing game. Japan and Sri Lanka currently enjoy friendly relations that could allow Japan to play a stabilising role in the region. However, the emergence of minilateral networks based on shared values and/or interests could split the IOR into rival coalitions, with Sri Lanka caught in the middle. 2019 will be an election year both in India and in Sri Lanka, adding more uncertainties to the China-India-Japan equation. Finally, Abe’s attempts to turn Japan’s Self Defense Forces into a regular army may likewise imply regional turmoil. Whatever these developments could mean for the future of Japanese-Sri Lankan relations, this burgeoning bilateral relationship is certain to have ramifications for the future of the Indo-Pacific. Anne-Léonore Dardenne is a research student at Lyon Law School and International Institute of Humanitarian Law. She tweets @aldardenne. Her research interests lie in International Relations and International Humanitarian Law, with a particular focus on Strategic and Security Issues in the Indo-Pacific and India-Japan-China Relations. Image Credit: CC by Mahinda Rajapaksa/ Flickr. Does the People’s Bank of China have “what it takes” to join the big league of central banks?